The 2016 MBA newsletter has been posted online. The 2015 results are also up in tabular format and mapped format. If you’d like a copy of your MBA observation in an Excel table let me know. And if you see any errors in the maps or the online tables let me know that too! 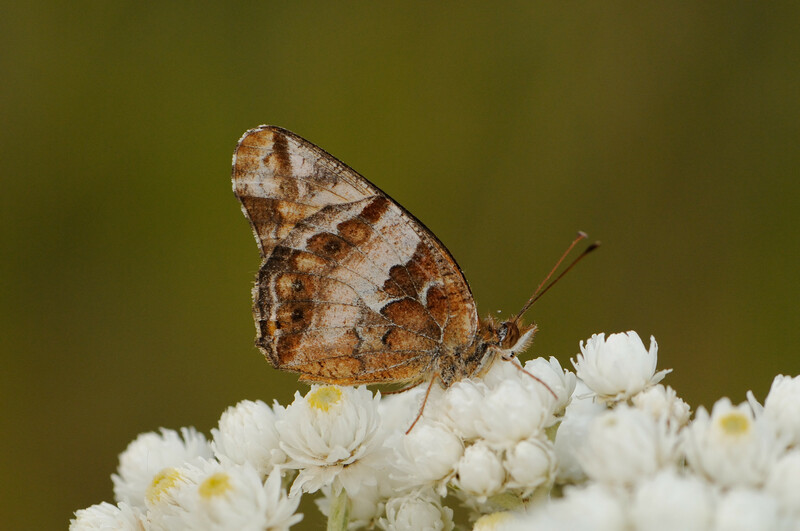 The azures have been a challenging for the Maritimes Butterfly Atlas (MBA) because there is (or at least was) uncertainty about just which species occur here. The most widely accepted classification was that three species occur here – Northern Spring Azure (Celastrina lucia), Cherry Gall Azure (Celastrina serotina), and Summer Azure (Celastrina neglecta). These three species are extremely similar in appearance, and the best way to distinguish them is by their flight time. The three species appear in sequence – Northern Spring Azure in May, Cherry Gall Azure in June, and Summer Azure in July. This was the classification presented in The Butterflies in Canada, a book published in 1998 that has become a major reference for butterfly classification in Canada. However, for the purposes of the MBA all the azures were treated as a single species – Northern Spring Azure. The decision to do this was based on the research and observations of Dr. Reggie Webster, an insect researcher and a member of the MBA steering committee. A paper published today (see http://zookeys.pensoft.net/articles.php?id=7882) corroborates Reggie’s classification system. Chris Schmidt and Ross Layberry have been able to demonstrate that all Celastrina in the Maritimes, and much of eastern Canada, are Northern Spring Azure (in their paper they refer to the species as Northern Azure). Their research showed that Summer Azure does occur in Canada, but only in southern Ontario, Manitoba, Saskatchewan and easternmost Alberta, and that Cherry Gall Azure does not occur in Canada at all. Summer records from the Maritimes that had previously been attributed to Cherry Gall Azure and Summer Azure are actually a second, summer-flying generation of Northern Spring Azure. This paper demonstrates that specimens are of great scientific importance even for really common species. The specimens collected for the MBA will be housed at the New Brunswick Museum and Nova Scotia Museum where they will be available to researchers for generations. Eastern Tailed-Blue is a species that has caused a lot of excitement during the MBA. Prior to the project this species was considered uncommon in the Maritimes, and the only records were from southwestern New Brunswick. The first couple years of the MBA seemed to confirm that – the first record for the project was a Grand Manan record from 2011 – the second year of the MBA. Then things started to change. In 2012 Eastern Tailed-Blue was recorded in eight atlas squares. These were all from New Brunswick, but some were from regions where the species hadn’t been seen before, including Albert and Northumberland Counties. In 2013 Eastern-tailed Blue was recorded throughout the southern New Brunswick and for the first time in Nova Scotia. In Nova Scotia it wasn’t just recorded once, it was found at four different locations! At one site near Debert multiple individuals with little wing wear were present, suggesting the species had bred there. In 2014 Eastern Tailed-Blue was again found at four sites in Nova Scotia, including three new MBA squares, and it was recorded for the first time from far northern New Brunswick (an August record from just south of Jacquet River Gorge Protected Natural Area), and, as I’ve just found out through material submitted recently, on Prince Edward Island! On September 4, 2014, Mark Arsenault collected the first record of Eastern Tailed-Blue for Prince Edward Island. Given how rapidly the species had spread on the mainland it appeared it was just a matter of time before on was found on PEI. It will be interesting to see what happens to Eastern Tailed-Blue in the Maritimes in the future. In 2015 there were relatively few Eastern Tailed-Blues reported. 2015 data is still being compiled, but records to date show in Nova Scotia it was only recorded in and around Kentville, and in New Brunswick the it was only recorded at Grand Manan and Fredericton (though I haven’t received records from a couple of major contributors who found many records for the species in the Saint John River valley in previous years). Well, it looks like the end is near. Here in Sackville there are still a few dragonflies about, and I’m sure on warm afternoons there’s you’ll find the odd Clouded Sulphur kicking around, but the sixth and final season is all but history! Clouded Sulphur. One of the last species to be seen each field season. Photo by Alain Belliveau. If you collected specimens or took photos this year now is the time to start assembling them for submission. Same is true if you have records that you have not yet submitted from previous years (the project was launched in 2010, but even older records are of interest). As always, specimens and printed photos can be mailed to the address below my signature. 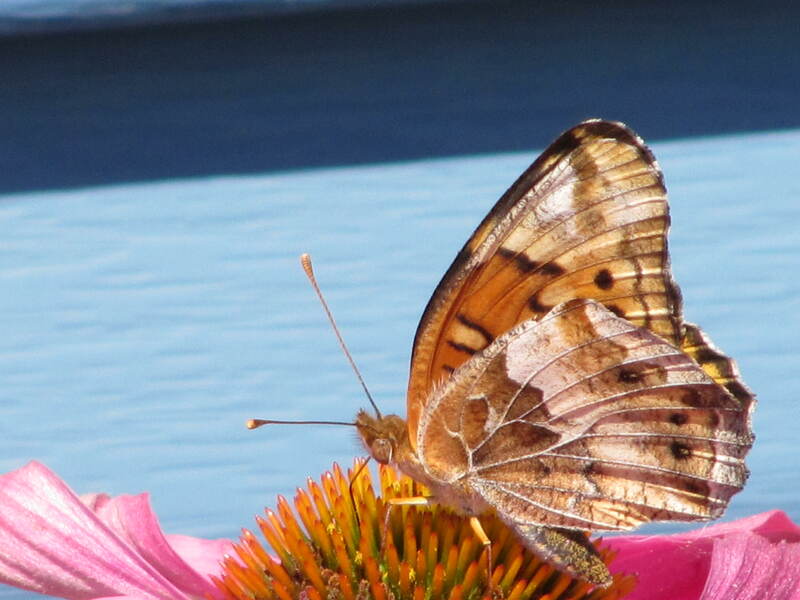 Digital photos can be submitted in a few ways, but the preferred route is eButterfly. If you have photographs and you are not sure how to submit them please get in touch. If possible, please submit your records by January 31, 2016. If you have a large number of records and you know you can’t meet that deadline please let me know. 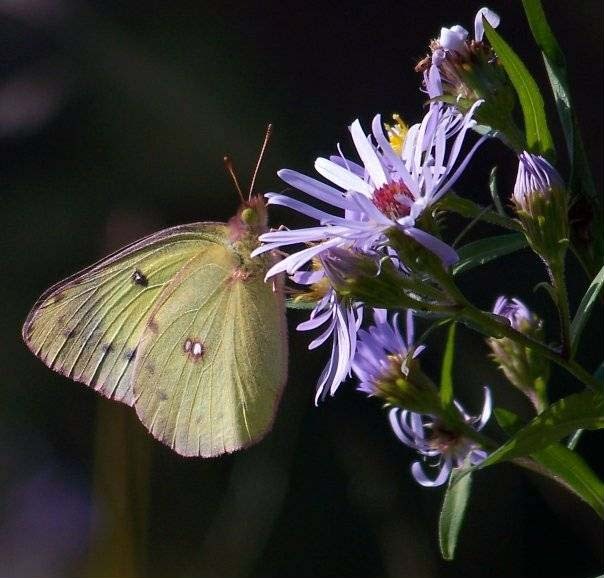 Over the past six field seasons the Maritimes Butterfly Atlas has been a huge success thanks to you! Thank you all for your contributions! Going forward I will continue to provide updates on atlas progress via emails (and you can rest assured this is not the last reminder to get your records in!). PS: Some closure for the August 6th post. The Variegated Fritillary irruption failed to materialize. No additional Variegated Fritillary records have been submitted since I made that post. On the heals of Ron Wilson’s Variegated Fritillary in Nova Scotia, I found one today (August 5) on Grand Lake, near Minto, NB! Could these records be the beginning of an irruption? Only one way to find out – get out and go butterflying! Variegated Fritillaries could show up just about anywhere, but flower gardens, meadows, and shorelines are likely locations. A new butterfly for Nova Scotia! Ron Wilson got a nice surprise in his yard in Berwick August 3rd – the first ever Nova Scotia record of Variegated Fritillary! This is a southern species that in most years colonizes much of the northern United States, the Canadian prairies, and southwestern Ontario. In the Maritimes it is previously known from New Brunswick, though there are no records from the Atlas period. Variegated Fritillary. Photographed by Ron Wilson on 3 August, 2015, in Berwick, NS. Ron’s record appears to be quite isolated. There have been no Variegated Fritillary records submitted to eButterfly from anywhere else in eastern Canada in 2015. Often extralimital records such as the Berwick butterfly are associated with large northward irruptions, but that doesn’t appear to be the case this time. Records for hairstreaks continue to come in. Since mid July, Striped Hairstreak has been found at Stellarton (Ken McKenna, Phil Schappert, and Derek Bridgehouse), Heathbell, Pictou County (Peggie Scanlan), Kentville (James Churchill and Mark Elderkin), Boisetown , Northumberland County (Ken MacIntosh), and Blackville, Northumberland County (Ken MacIntosh). Banded Hairstreak has been found at Kentville (James Churchill and Mark Elderkin), Kingston, Kings County (Liz Cameron), and Port Williams, Kings County (James Churchill). Acadian Hairstreak has been found at Moncton (Peter Gadd). There are probably many other records out there – these are just the ones that have been reported through email or eButterfly! 2014 Results mapped: The Google Maps have been updated. They now include all data submitted last year. Check them out here. The species-level maps and species lists for each square should all be correct, but there are some minor details in the notation provided for each square (what you see when you click on a map) that will be fixed soon. If you notice that any of your records are missing please let me know (jklymko@mta.ca). A special thanks to Alan Macnaughton of the University of Waterloo for maintaining these maps! 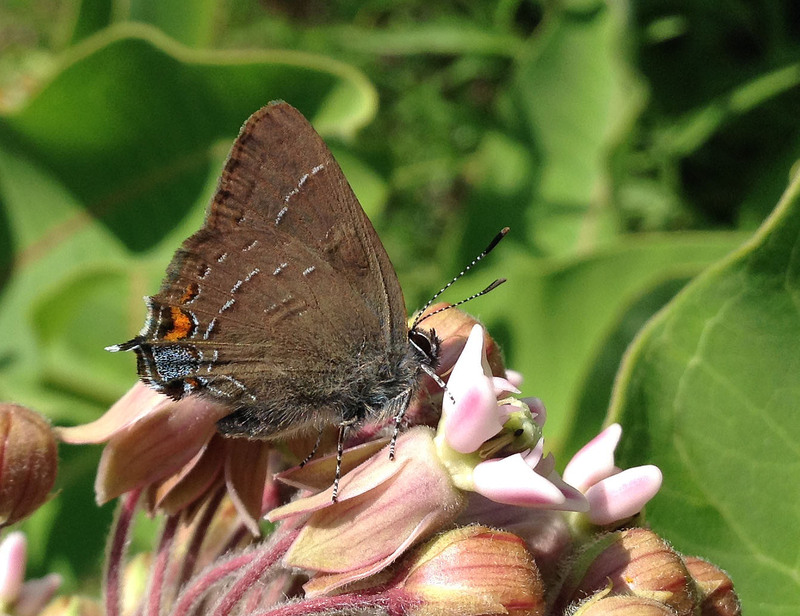 Hairstreak alert: James Churchill found Banded Hairstreak at a patch of milkweed today (July 13) in Kentville, NS. This same milkweed patch hosted Banded and Striped Hairstreak last year. James commented that about half of the milkweed in the patch is now in flower. Milkweed is not a host plant to the caterpillars of our hairstreak species (i.e. the caterpillars don’t eat the leaves), but their flowers is a great place to look for nectaring adults. It’s always a good idea to check milkweed flowers when you see them! Baltimore alert: Richard Mash and Ken McKenna found large numbers of Baltimore Checkerspots the weekend of July 4 in Nova Scotia. They got it in at least five different atlas squares in Pictou, Antigonish, and Guysborough counties. Up until the end of the 2014 field season this species had only been recorded in six squares in NS during the atlas period. Keep your eyes out for them in and around wetland habitats, including ditches. We may have passed the peak of their abundance, but some will be around for a couple more weeks. Greenish Blue alert: Roy LaPointe has been monitoring the Greenish Blue population he found at the St. Leonard, NB, airport on June 27. He has seen the population swell, with at least 36 present July 10. Be sure to check Silvery Blues carefully, especially if you’re in northern New Brunswick, because you never know where another population of Greenish Blue could be awaiting discovery!